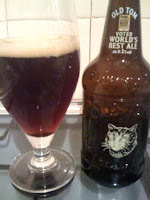 Another instalment of my beer round ups. Covering things, good and bad, that I've drunk since the last one. 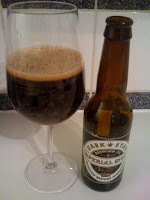 Dark Star Imperial Stout. Mmm, Dark Star. I love, love, love Dark Star Six Hop, so whenever I see one of their beers, I go for it. This is one is deep black in colour with some tan bubbles on top. The smell is dark fleshy fruits, alcohol and (call me crazy if you will) ... coconut. It feels very smooth and creamy in the mouth with a big roasty, bitter finish. The fleshy fruit comes through in the taste giving a slight winey note but, rather oddly, there is way less roasted flavour than you'd expect. Very interesting and very good. 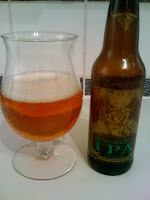 Stone Ruination IPA. This one had been at the back of the cupboard for a while. Based on it's self-confessed "ruinous" effect on the palate, I'd been avoiding it until I knew I wouldn't be eating or drinking anything afterwards. The colour is a delicious golden-amber with a small loose head. The smell is basically liquid hop with some very slight caramel/toffee in the background. At 100+ IBU's, you expect it to be bitter ... and it is. The biggest flavour by far though, is sickly caramel sweetness. You drink this beer and you think "maybe it will be too bitter to be any good" but, ironically, it was the sweetness that killed it for me. A few mouthfuls in and it's just too sweet. I know a lot of people rate this beer, but for me it isn't balanced. The nose is too much hop and the taste is too much sweetness. A real disappointment. Robinson's Old Tom. Voted World's best ale by 'Beers of the World' magazine, I found this in Sainsbury's for less than a few quid, so had to give it a go. The colour is chestnut with red hints when held to the light. The nose is quite complex, at first you get dark malts giving you ripe dark fruitiness, this then moves into a woodiness and reminds of a barley wine. The taste has lots of malty-sweet fruitiness up front, this moves on to a woodiness and then a slightly tangy, subtle bitter finish. Very good. I kept thinking throughout that this reminds me of Brewdog's Divine Rebel, it really does have that barley wine taste to it. I can't help but feel this would really lend itself to cask ageing. 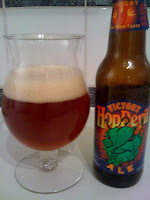 Victory Hop Devil IPA. I've heard people say they think this is great and I've heard people say they think this is rubbish. The colour is a lovely copper-orange, the head is quite fluffy and white, there's a slight haze. The nose is good, big orangey American hops with a background of sweet caramelly malt. The hops follow through into the taste and are accompanied by burnt sugar sweetness and a bitter finish that really grows on you. It's really imbalanced though, the hops come in and take over, leaving you with an almost over-stewed-tea flavour. Starts well, but lets itself down with the lack of balance. You could be right. Maybe the hop would come through more in the taste, if it were fresher, balancing all that sweetness. Maybe it's just a personal taste thing. I think the Ruination and the Hop Devil are just way past their best - they are beers which HAVE to be drunk fresh or they just fade away into yuck. I haven't had a good Victory IPA yet and think it's because they just haven't lasted the journey. I've got a couple of Dark Star Imperial Stouts in the gargage aging so looking forward to see what happens to them in a few years. It's a shame that it isn't easy to a comparison between new and old (without, you know ... going to the US). Good shout on the Dark Star stouts. I'm sure they'll just get better and better.